Creating my everyday: Happy Monday! 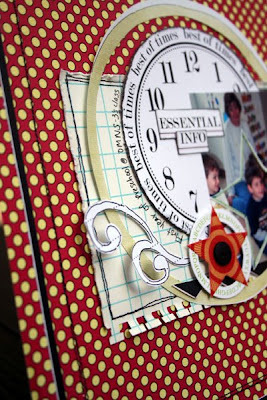 I used a chipboard and acrylic piece from one of my Fancy Pants mixed media albums. I used lots of paint and glitter on the chipboard, and then I dressed my sign up with patterned paper, an acrylic piece, chipboard and some stitching. This was such a blast to make, and it's now happily perched on my front door. 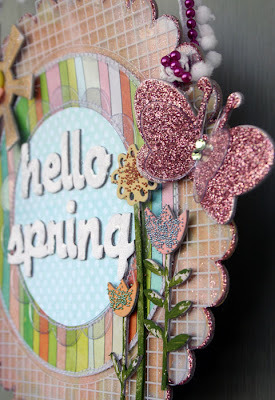 I also have a layout to share using the gooorgeous April kit from CMK. This was done for my DT challenge this morning to use the negative image from a sticker on a layout. I used the star (leftover from a Sassafrass Lass sticker that I used on a previous layout) to call attention to part of the photo. Well, friends, my Monday evening TV is starting soon, so I have to go get comfortable - I do have my priorities, you know, heheha! Thanks for the wonderful comment you left me on my Blog!! Love the projects!!!! Spring is my favorite time!!! Love the use of the negative space on the LO!!!! We did have some great weather, now we are in for it!!! Happy Monday!!!! I love that sign, will definitely need to get my paper supplies out and do something for Spring!!! 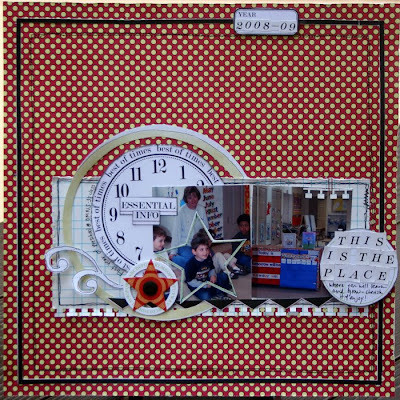 Awesome layout and love,love, love that door hanger! So fab! Thanks for the inspiration! Love all the detail work on the door sign Staci! Way cool! And the layout is pretty awesome also! Monday night TV, huh? Would it involve Dancing With the Stars, or am I the only shmo that gets hooked on reality TV? Either way, I hope you are all snuggled up enjoying the tube! such a clever idea with the star sticker negative ,Staci ! adorable layout ! wow ! the weekend just whizzed pass us here ! I totally missed that CMK crop ! 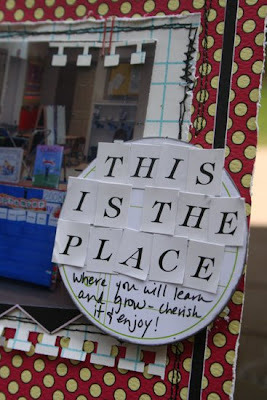 lovely sign you've created with your FP goodies ! 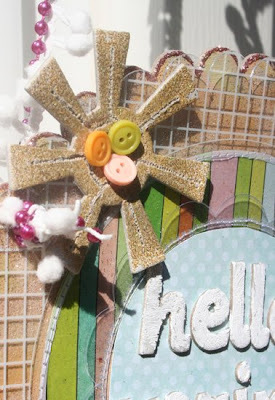 oh i want that hello spring sign!! too cute! 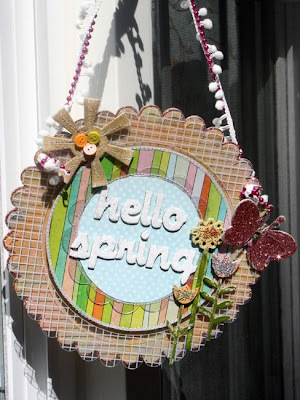 That spring door hanger is fabulous!! I should really start thinking of making some projects to display around the house as well. When I see what fun projects others create, wow, it all looks so cute! Love the LO as well, that background paper is gorgeous and I like those different frames you made. Love your spring sign!! So cute and the layering is gorgeous!! Sorry I missed it! btw- thanks for your sweet comment!! Hi Staci! Looove the Spring sign!!! Hope you guys are having a good week! What a super cute door sign Staci! Cute layout of your son , I love the star that is drawing attention to him in the picture! I really think your door hanging is fabulously CUTE! Great idea! And so is your use of the negative from the sticker sheet! I've used negatives from chipboard before, so I'll have to remember to use up those sticker negatives too! Thanks, chickie! "The donkey ate my finger!" Can I go back to sleep?